As parks and gardens get more and more use by the public especially in our urban areas, many places are seeing increasing effects of this heavier use on the horticultural elements of our gardens. While it’s exciting that our culture is putting greater value on our green spaces, the effects of substantially greater use have pushed the industry to respond in a number of ways. This includes new design strategies and technologies that enable new landscapes to be more tolerant of heavy use, and the incorporation of those strategies and technologies in older existing landscapes, where possible. In addition, new or more intensive management strategies are necessary to maintain existing landscapes, especially those that cannot be physically changed to adapt to the heavier use. 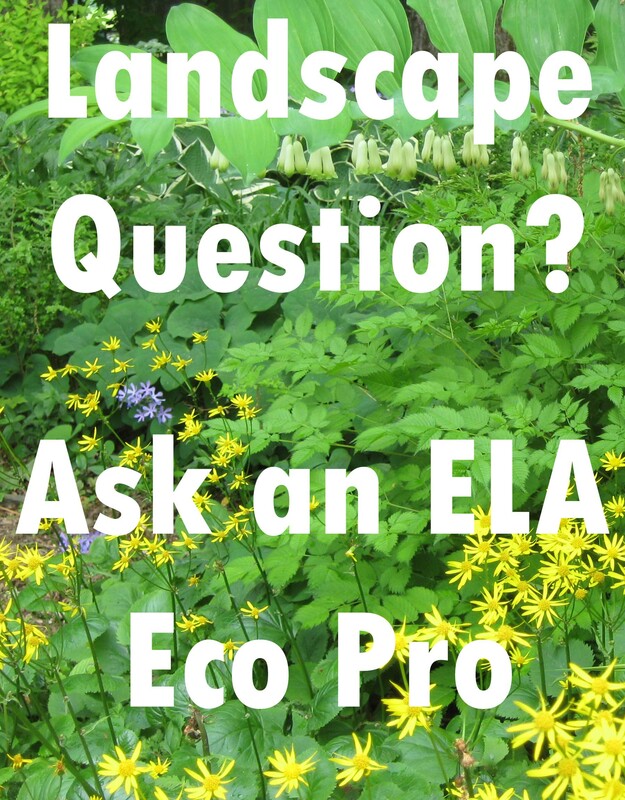 This article will focus on the latter and look at some of the practices and concerns surrounding heavy use in landscapes. For over 20 years I’ve worked in the landscape industry primarily in horticulture maintenance and landscape management. My career has led me to many places including over a decade with NYC Dept of Parks & Recreation, the High Line, and the Brooklyn Botanic Garden. I’ve seen it all – baby carriages and motorcycles dumped in a small pond, pit bulls trained by being hung on lower branches of small trees, specimen trees covered 25 feet high in carvings accumulated over 60 years, standing-room-only event crowds packed on a lawn soggy from a recent rain, and much more. Cherry Esplanade at Brooklyn Botanic Garden in early spring, 2015. A lot has changed in recent decades in the amount of use and subsequent impact of visitors to parks and gardens, and in advances in the landscape industry to accommodate and mitigate this intense use. 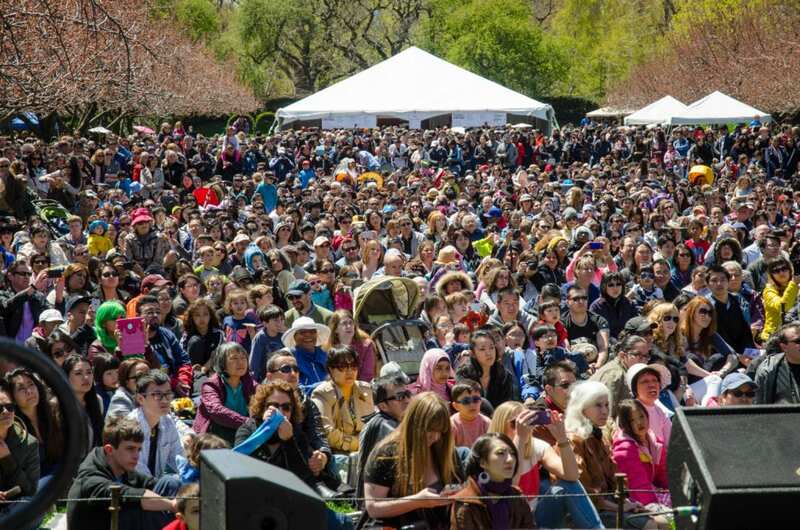 Much of my career has been in New York City, where a public lawn can get up to 100,000 visitors on weekend, and the community uses its local parks and gardens as a personal backyard, in every sense of the word. To best accommodate these great and growing crowds (After all, we do want our parks and gardens to be used and appreciated! ), it is important to develop a management strategy that deals with the specific issues of any particular landscape. This article presents a lens through which to view the impacts of heavy use in order to identify and better address the issues surrounding the wear and tear that results from it. The thoughts and approaches presented here are my own, and I welcome continued dialogue on the topic. 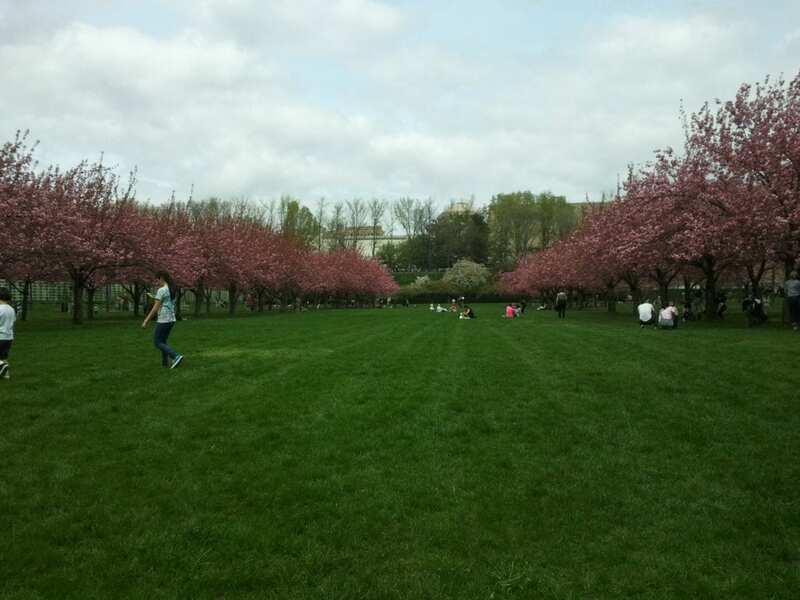 Cherry Esplanade at Brooklyn Botanic Garden during the 2015 Cherry Blossom Festival. What is wear and tear? According to Wikipedia, wear and tear is “damage that naturally and inevitably occurs as a result of normal wear or aging.” Other sources define it similarly, the main point being that the damage, impact, wear or stress is caused by normal use. The key here is “normal use” – in today’s public green spaces, heavy use is consistent enough to cause predictable damage, and as such should be considered “normal.” Therefore, we can and should plan for it in our standard maintenance strategies, and no longer handle it as an unusual occurrence. Contributors to wear and tear can be divided into two categories: physical impacts and organizational practices. Physical impacts are those that have a direct physical effect on the landscape and come from outside the institution, organization or agency that manages the park/garden. In contrast, organizational practices are rooted within the institution, organization or agency. Below are some examples of the distinction. 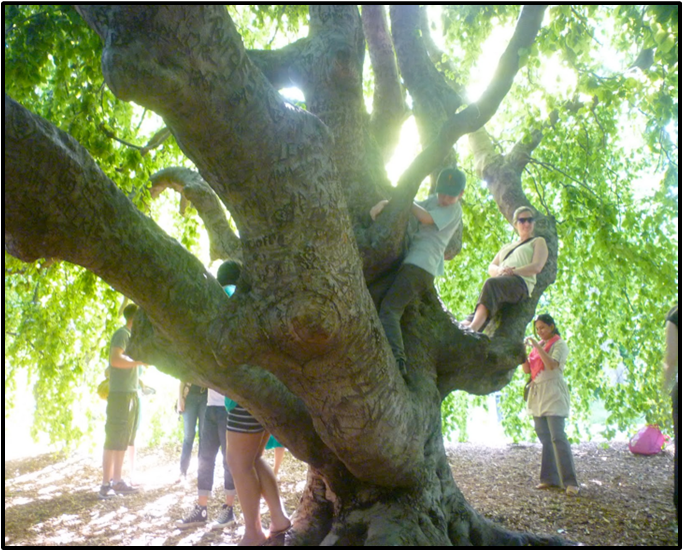 Visitors hang out in a protected 80-year-old Weeping Beech, despite ropes and signage. 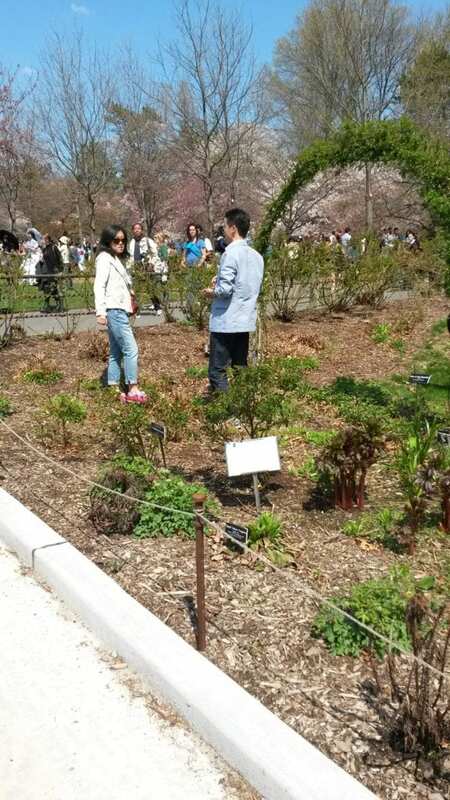 Visitors ignore the fencing and stand in a designated plant bed, on top of tender newly emerging perennials in the spring. Lawns are more likely to flood due to compaction following major events when no preventative measures are taken. 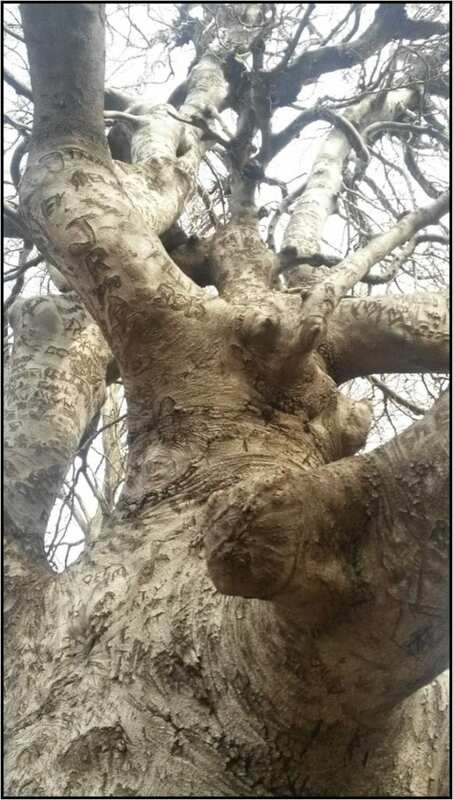 Looking up into an 80 year old Weeping Beech, approximately 60 years of carved graffiti rises 25 feet or so. 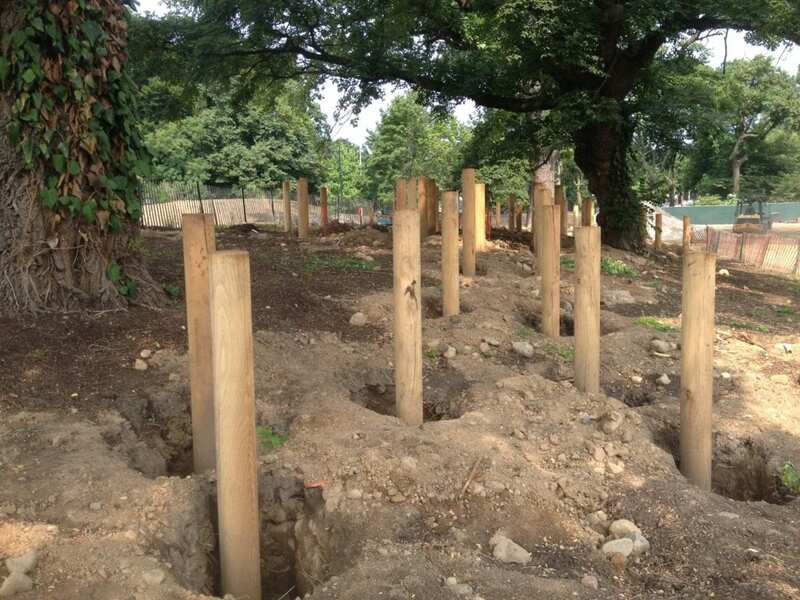 Design impact: posts were sunk in the root zone of mature corkwood trees to support a boardwalk designed to meander through the trees. 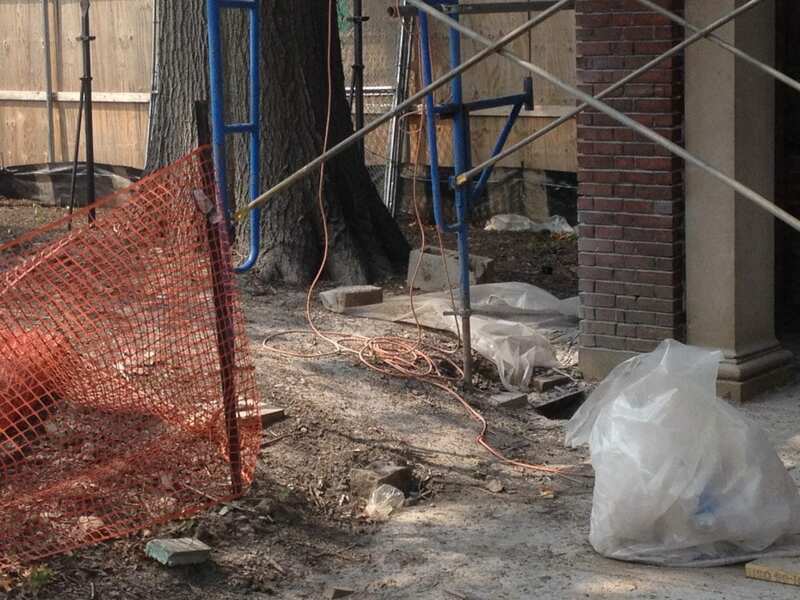 Construction impact: crews disregard tree protection zones during construction. 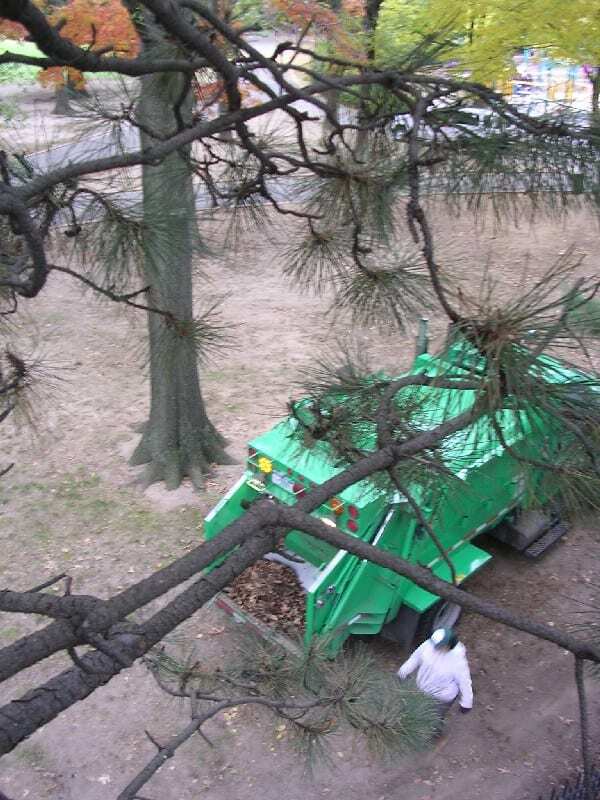 Out of habit, a garbage crew drives under trees to reach its destination. 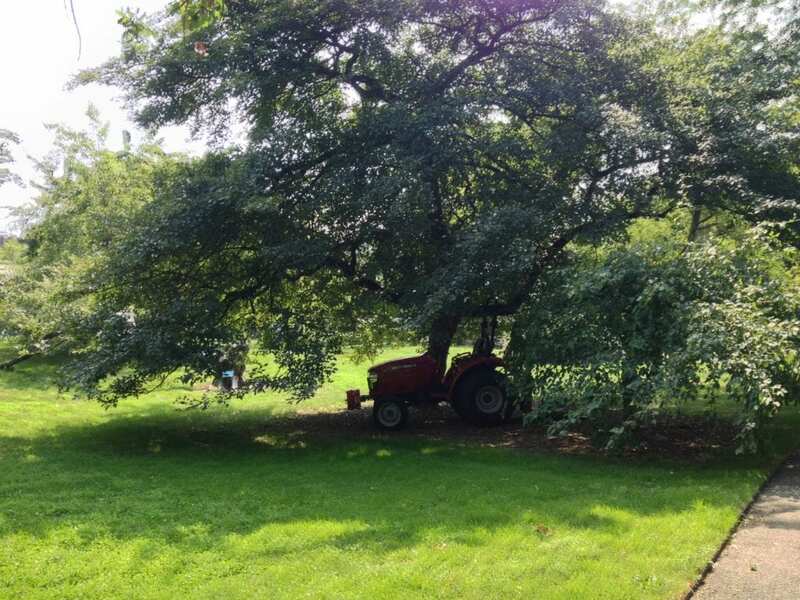 Parking a horticulture tractor in the shade beneath a tree is a convenience for the gardener working nearby, but takes a toll on the tree. Often these contributing factors overlap, both within and between the two categories. For example, institutional priorities will affect how much of the annual budget is allocated for staff. Likewise, lack of staff will impact the ability to manage high visitor numbers. How Can We Manage Wear and Tear? It is difficult – if not impossible – to entirely prevent wear and tear where there is heavy use. A more realistic goal is to reduce its impact. By far the greatest impact overall is on soil, which in turn effects plant health in general. The effect can be seen most noticeable on lawns, but also on trees as their roots are affected, and even in plant beds when people walk through them. Let’s look again at the physical impacts and organizational practices as we consider options for preventing wear and tear. Some of the best ways to manage physical impacts are those tried-and-true methods that are familiar to everyone. Though generally they are not entirely successful, they are still commonly in use because their effect is clear nonetheless. Examples include signage, fencing and compaction mats, the latter being specifically used for special events. More and more, signage has moved from stating rules like “keep off,” to explaining guidelines (see photo). The jury is still out whether one strategy is more effective than the other. Instead, the texts seem to reflect the relationship the organization holds with the public. Signs can guide visitors to do the right thing. 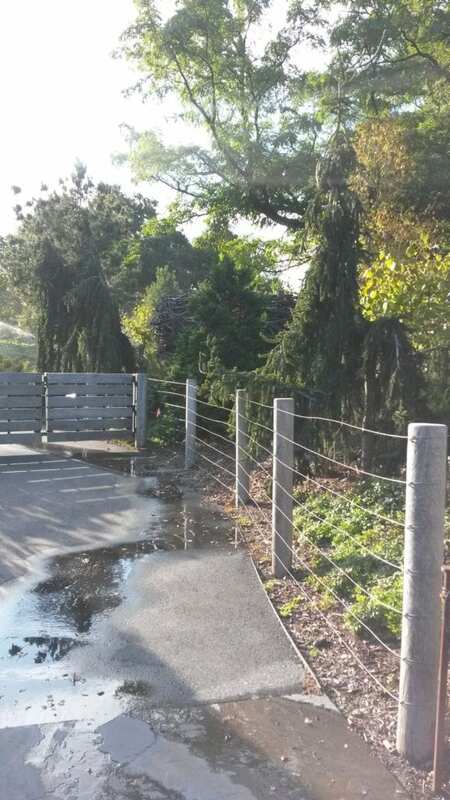 Fencing, or bed protection, can serve as a visual guide or reminder, or it can be an actual physical barrier. In either case, it is not a fool-proof method and only deters a portion of the visitors. However, every little bit counts. Bed protection at the High Line serves as a visual guide. Posts are hollow black tubes with an eye at the top for threading rope through. Permanent tall fencing at Brooklyn Botanic Garden serves as an actual barrier. 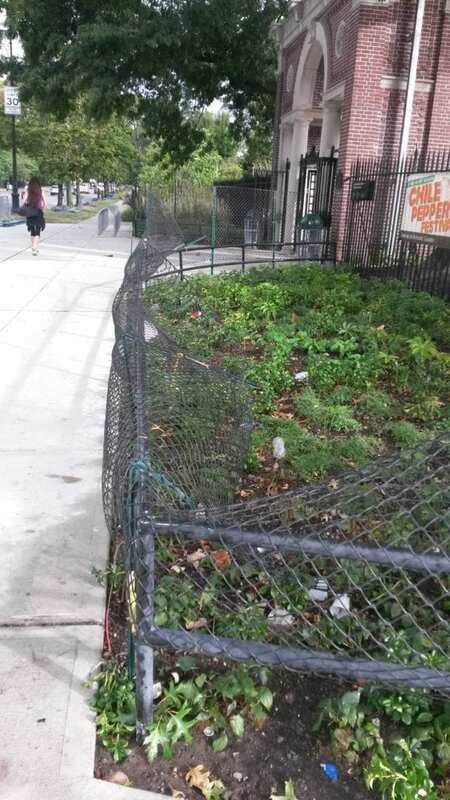 Plastic temporary fencing added to permanent fence outside Brooklyn Botanic Garden prevents public festival revelers from entering plant bed. This strategy was only moderately successful; fence posts were bent and actively destroyed with disregard for plant bed; however, clearly plants were protected to some degree. Brooklyn Bridge Park has even taken to creatively using strategically placed thorny shrubs to discourage the public from entering areas they shouldn’t. Compaction mats are a great option on lawns when it is not necessary to actually feel or see the grass. For example, compaction mats should be used under a temporary stage, but probably wouldn’t be laid in front of the stage where the public would prefer to sit on the grass. 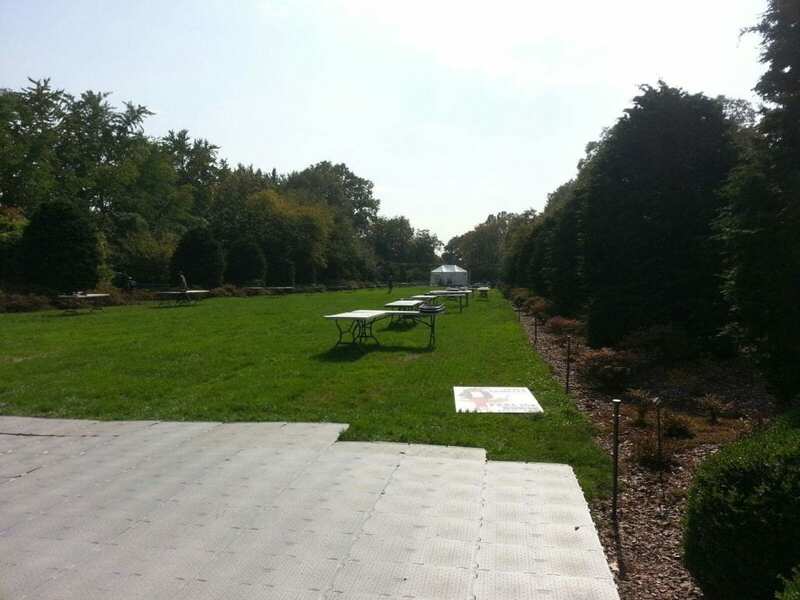 Installed before a major event, compaction mats protected the lawn at the location of a temporary stage. Another strategy is the presence of security guards. 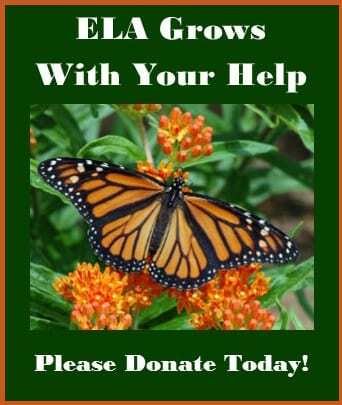 This is an expensive option and most parks and gardens cannot afford enough staff to protect all the plants; however, when this opportunity is possible, it is by far the most effective. Lastly, and according to some most importantly, is engaging the public in the mission of protecting the plants. Education is a primary aspect of this. As in the photos, some degree of education can be done through signage, although that is inherently minimal. 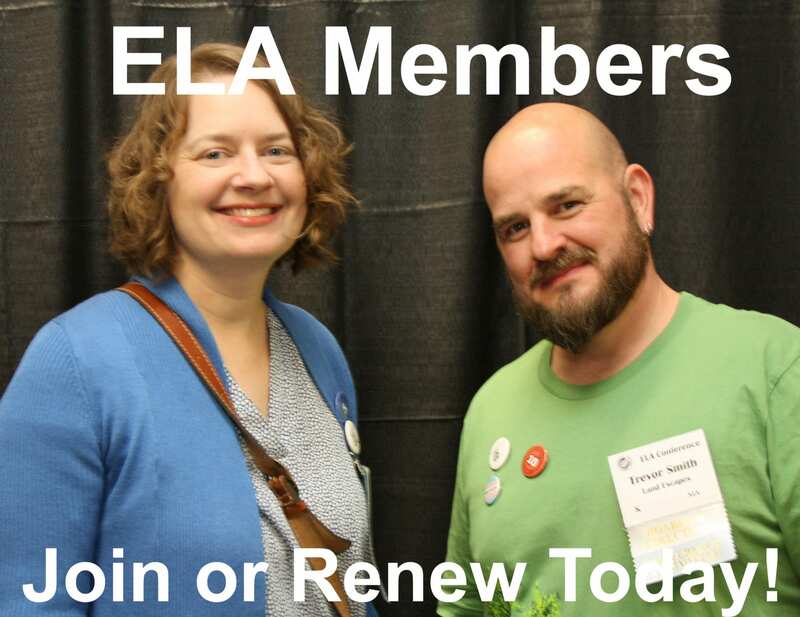 More in-depth education can be accomplished through blogs, talks, pamphlets at events – no doubt some readers have creative ideas that would be great to share. This is a long-term investment, and consistency is key. But those who have invested in educational strategies have often had positive and longer-lasting results that can even spread by word-of-mouth through a park community. Involving the public in caring for a park or garden can also lead to a sense of ownership and a shared sense of responsibility to protect the landscape. 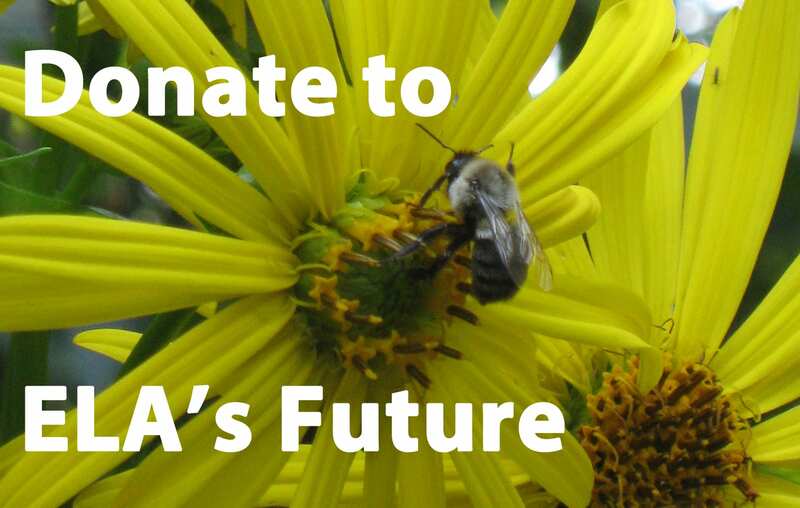 Some organizations, however, are hesitant to go that route because the increased sense of ownership by the public can at times become disproportionate and end up inhibiting the organization’s ability to care for the landscape. Managing organizational practices is at least as important as managing the physical impacts, although the results may not be as visible. Because organizational practices determine the extent of physical preventative measures put in place, it is crucial to first consider these organizational practices and from there determine which physical measure, and how much, will be put in place. That said, shifting and adjusting organizational practices is often a long-term endeavor. In today’s financial climate, organizations rely more and more on event revenue out of necessity. Financial stress combined with a lack of horticultural expertise by those who set event calendars can lead to repetitive heavy use that no amount of preparation will mitigate. To even consider horticulture in any such planning requires an initial understanding that many in Events Planning simply don’t have. The only remedy is education by whatever means available. Ways to educate an organization’s staff can include staff talks, regular horticulture newsletters, tours, informal emails, and taking every opportunity to explain why things are being done a certain way. In addition, it’s important to make sure an organization’s expectations for horticultural aesthetics is in line with the reality of the impacts of heavy use. For example, on a lawn with major special events on a weekly basis, it should not be expected that the lawn will have a consistent thick carpet of lush, emerald- green, weed-free grass. Rather, depending on a variety of factors, it could be expected that the lawn will have moderate coverage and reasonable weed management. If those are the institutional expectations, all parties can work together to aim for such a goal. One more element to consider is staff habits. There are times when, as a mentor of mine once said, “We are our own worst enemy.” Too often, horticulture or other operations staff contribute to wear and tear because of old habits. This can include such things as a garbage truck driving directly under trees or over lawns on a daily basis to collect from trash cans that could easily be moved beside a road, to gardeners parking vehicles inside the drip lines of trees so they’re in the shade while the gardener is working, and many variations on the theme (see figs. 8 & 9). Changing the habits of our own staff can be difficult and sometimes the most frustrating challenge. With staff there are generally two options: find a way to get their buy-in for change, or force change through supervisors. Getting their buy-in is always the most effective means, though not always the easiest. Educating staff on the effects of their actions can be challenging. Other options can be linking explanations with other issues that resonate with staff, or incentivizing change in various ways. Almost any creative ideas on gaining staff buy-in are useful and worth trying, and when necessary forcing change can be an option. Lastly, it’s important to realize that heavy use will continue to be a reality in our landscapes, and therefore we must adjust our standard maintenance plans accordingly. This can include continuing current practices but carrying them out more frequently. Examples include checking fences, bed protection and signage more regularly, and air-spading more frequently to relieve soil compaction in tree root zones in heavy use areas. 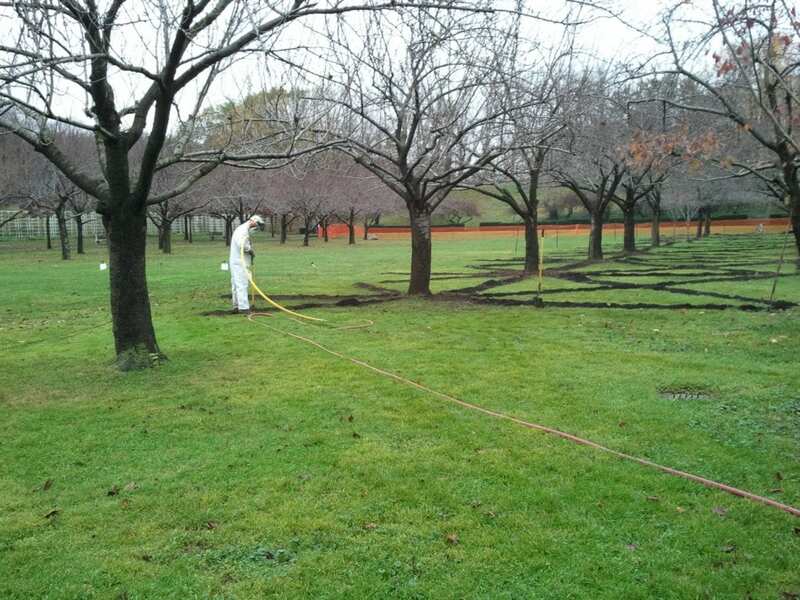 Using an air spade under Kanzan cherry trees relieves intense compaction caused by significant special events. Additionally, we could incorporate additional practices into the standard management plan. For example, on heavy use lawns, in addition to annual fertilizing, aeration, overseeding and topdressing, it may be worthwhile to add the use of the Air2G2 or the Shockwave, both now used in industrial ballpark technology, to aerate at much greater depths and break through hardpans. Using these tools in addition to improving soil biology is particularly effective. Air2G2 injects compressed air into the ground through perforated metal pipes as deep as 12+ inches. 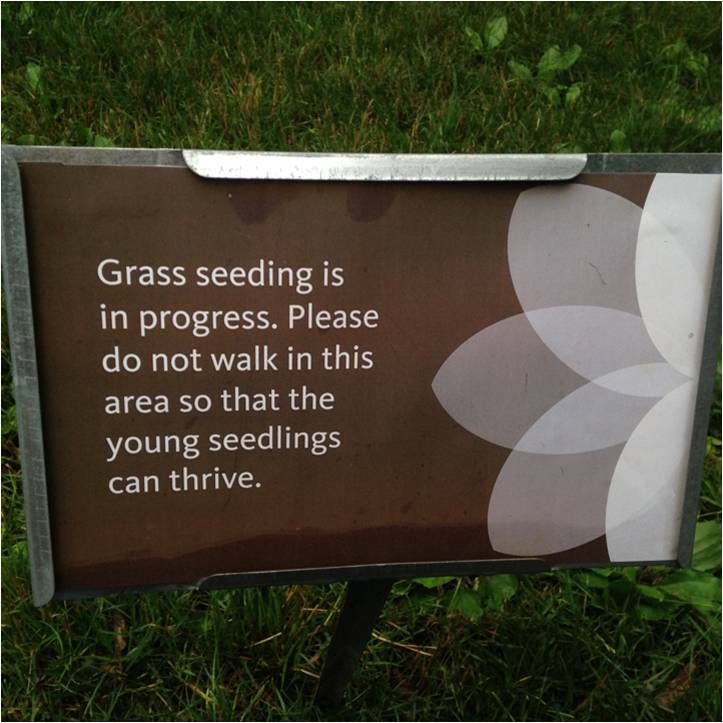 Shown in use at Brooklyn Botanic Garden, June 2016. 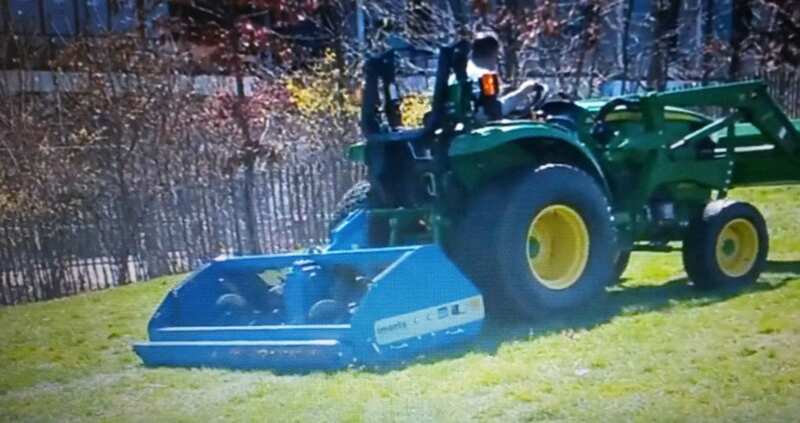 Shockwave uses adjustable rotating blades (seen in blue tractor attachment) to slice into lawn up to 15 inches deep. Shown in use at Brooklyn Bridge Park, March 2016. Regarding specifically organic lawns, the High Line, Brooklyn Bridge Park and the Brooklyn Botanic Garden each have a policy of closing lawns for one to two days each week. 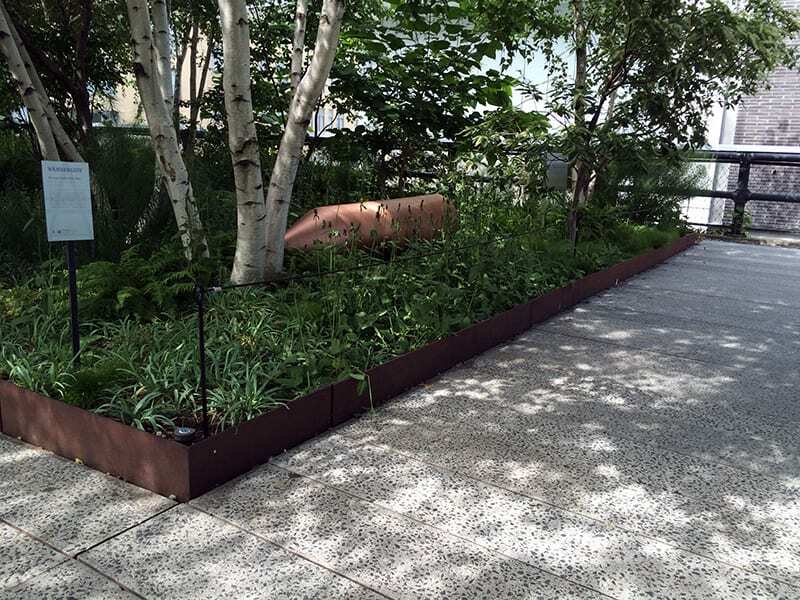 The High Line and Brooklyn Bridge Park additionally close lawns during or after a heavy rain when the lawns are too soggy to handle foot traffic. 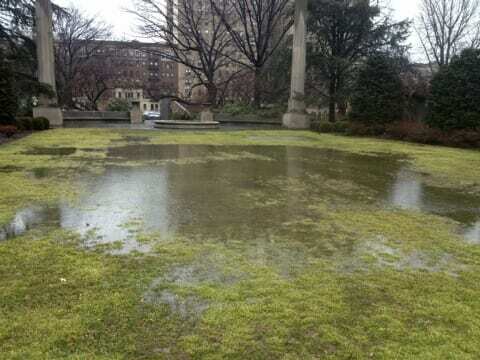 Brooklyn Bridge Park will also, on occasion, cancel events if the lawns are too wet and soggy or in the midst of a heavy rain. Brooklyn Bridge Park has a detailed management strategy with guidelines on when to irrigate and when to close lawns in relation to events. As a rule, dogs are not allowed on any of these lawns. This level of care is time consuming but necessary on organic lawns, which inherently require more attention than non-organic lawns. Even non-organic lawns, however, require additional care when in a heavy-use environment. Central Park’s main lawns remain open spring, summer and fall, but are closed for the winter to give them time to rest and rejuvenate. Each landscape will have its unique combination of factors specific to that site, and the best way to move forward in managing any site is to begin by identifying those factors. Hopefully this article has provided a lens through which to consider specific sites, and lays a foundation for ongoing discussion to share our experiences and learn from each other. I welcome further conversation and hope to hear from others about your approaches and methods. Ronnit Bendavid-Val is the Director of Gardens and Grounds at the Brooklyn Botanic Garden (BBG) where she directs horticulture staff and oversees horticultural design, maintenance, and best practices for the 52 acres of public gardens. Bendavid-Val has decades of experience in public gardening and sustainable horticulture, including more than ten years with the New York City Department of Parks and Recreation, where, as director of citywide horticulture, she helped guide a shift to more sustainable horticultural practices, oversaw gardener field training and was responsible for defining unified gardening methods and standards in all five boroughs. Directly prior to her position at BBG, Bendavid-Val served as vice president of horticulture and park operations for Friends of the High Line in New York.